Since beginning his filmmaking career at Toei, Gen Takahashi has rigorously defined himself as a true independent spirit. He has maintained a maverick sensibility throughout his self-administered education in filmmaking, work methods, and even thematic motifs within his films. Sure enough, he has been working outside of Japan since 2002, and in 2004 established his Hong Kong-based production company Grand Café Pictures. His filmography includes his debut Heartless (1992), Lucky Killer (1993), Lady Plastic (2001), and Charon (2005), which won the Fantaland Grand Prix at the Yubari International Fantastic Film Festival. Easily his crowning achievement thus far, Confessions of a Dog (2006) skillfully blends gripping genre elements with social commentary in its three hour-plus portrayal of corruption within the Japanese police force. His most recent film is 2008's Goth. This interview was conducted during the 2010 Shinsedai Cinema Festival in Toronto, Canada. Special thanks to Tatsu Oki for acting as a translator for this interview. The film's main subject is police corruption, a very real problem within Japan. How closely are specific scenes and incidents in the film based on actual events? It is a fictional story, a drama, but the incidents depicted within the movie itself are real. For example, there is no Takeda in real life, so in that sense, it is a fiction, but the activities in the film that the police participate in are real. What kinds of sources did you research while writing the film? Basically, I didn't need research, because I knew very well what was going on in the police. A long time ago, when I was twenty, I actually joined an underground society. Of course, I wasn't doing anything illegal, but I knew very well the worlds of the police and the underground societies in relation to each other. So I basically drew upon my experience for the story. 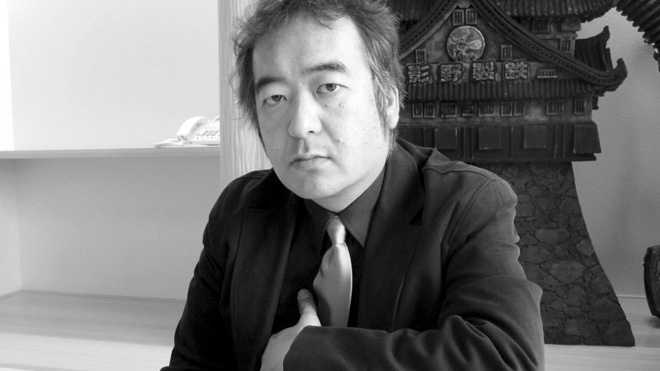 Additionally, one journalist, Yu Terasawa, joined our production as a supervisor. So the story is a mix of my experiences and additional material from Terasawa. Did you consult anyone actually active in, or retired from, the Japanese police for the film? The police have been doing the same thing for so long that I actually didn't need anybody within the police to give me new material. I did speak to people who had quit the force, but they weren't really able to elaborate on any information that I already had. The film never received a theatrical release in Japan. Did you experience any difficulties during the pre-production and production phases of the film? The question is, why do the police in Japan not stop their illegal activities? It's because the people are docile. It's not like in Korea, for example, where, if something happens, the people rise up and have demonstrations. Nothing like that has ever happened in Japan. So, even if I make a movie like this, the police won't come after me. It's not like the FBI in the United States would put out a hit on me or anything like that. Nothing like that would happen. And when I applied for documents like filming permits, they came through with no problems from the police. And one more important reason: basically, Japanese society doesn't care about filmmakers - especially independent filmmakers. They look down on me as an independent filmmaker. Independent filmmakers like me seem to have no influence on society, and whatever I produce doesn't have an effect on society at large. If it was a large studio like Toho, for example, it would be different. It actually happens that last year, they were planning a film similar to mine - and they were probably shut down by the police because, in a large company like Toho, there are former members of the police who have become executives in the corporation. The larger the company, the more likely a project like this is to be shut down. Could you describe how you learned that Confessions of a Dog wouldn't be receiving a theatrical release in Japan? I get this question a lot. The movie was completed in 2005, but what was interesting was that my investors hadn't attached any conditions for deadlines to release the film in order to get back their revenue from ticket sales. So, since there was no deadline, after the film was completed, the company that funded my project went under. There was no big rush to actually release the film into theatres. It wasn't because there was any kind of police pressure or anything like that. It was because there was no internal pressure to release the film. And also, I had moved on to another project by that point. The film itself had basically been released in other countries before Japan, so the order became sort of reversed. How has the film been received at film festivals abroad? Do any particular reactions from audiences in other countries stand out at all? Last year, I showed the film at the New York Japanese film festival Japan Cuts. The audience was almost at full capacity, and there was a very good reaction. What I heard a lot at that festival was that it was a strong film - but with the caveat that it was a strong film compared to recent Japanese films. A lot of Americans mentioned that they were critical of recent Japanese films because they were very long on entertainment but short on social commentary. So they said that my film has a basis in entertainment, of course, but there was this edge that they commented on with this film. There was a lot of attention paid to it because of that. In fact, it came in at second place in the audience awards at that festival. Were there any films or filmmakers that you looked to for inspiration for Confessions of a Dog, or that inspire you as a filmmaker in general? Confessions of a Dog itself I don't believe had any sort of specific basis on any film or director, but for myself, I have been influenced by a lot of classic films. Japanese directors like Kurosawa, of course. From France, the French New Wave - Jean-Luc Godard, Truffaut, Alain Resnais. From Italy, some filmmakers, and Americans like John Cassavetes, Martin Scorsese, Stanley Kubrick. Of course, the Canadian director David Cronenberg. Various films. But for me, it's not necessarily about any particular directors, but rather individual films. Particularly, when I was in my twenties, the classic films that influenced me were those that people of my generation were seeing at the time. I looked at a lot of the techniques that Kurosawa had used. I was basically self-taught. I wasn't taught anything in any school. One quote from Kurosawa advised directors to explain everything at the beginning of the film. The reason why Confessions of a Dog is three hours long is because the explanation about the good cop gone bad is all made at the beginning, and then the rest is all about the emotions surrounding him. That's one scriptwriting technique. Also, there is a technique that Kurosawa used that is present not only in this film, but in others I have made, which is a close-up through a telescopic lens. For a scene in a room, the camera is farther away from the actors, who in turn act more naturally in the environment. Actors have a harder time acting naturally when the camera is close to them. I also try to select a piece of music that matches the scene, so that the actors can listen to it beforehand and gain a better understanding of the scene. Confessions of a Dog very much fits into the police and crime film genres, yet your following project, Goth, is more of a horror. Do you have any attachments to any particular genres, or do you consider yourself better suited to some than others? I'm not really well-suited to love stories. I understand what you might call "man films" - hard-boiled movies. I don't really understand the actual idea of films about love. No matter what the genre - and this has been true of my films in the past, and with this film right now - the protagonist is always an outsider, an outlaw. The minority voice is something that comes about very often in my films. I could, I suppose, write a love story, but I wouldn't be able to have a corporate executive, for example, as the main character, because the main character has to be outside of the system, or somehow spun off. You began your career at Toei studios, yet decided you would be better suited as an independent filmmaker. What made you want to make this transition? Basically, the studio system as you might understand it in Hollywood does not exist in Japan. The reason why I went to the studio was to learn the techniques of how to shoot a movie. But there is no actual system as we understand it from Hollywood in Japan - it doesn't really exist. It's just almost like a framework. It's very simple - when I was at the beginning of my career as an independent filmmaker, it was more difficult to learn how to make a film. At first, I joined a typical Japanese movie studio so I could learn everything in one place. I didn't start off being in the studio system, then left it to become independent. I had the idea of being independent to begin with, and the only reason why I joined the studio was to learn the techniques of filmmaking. For example, regarding budgets and how much equipment would cost, when I was in the studio, I was a junior member. What I did was I went to my boss's office and, after everyone had gone home, I would open his desk, rifle through his paperwork and discover, "Oh, cameras cost this much; lunch costs this much." I would understand everything that would be involved cost-wise in the project. Then, later on, I could use that information to go to investors and ask them for such-and-such amount of money, and I would be able to balance my films that way. To shoot a film, you need shooting permits. I actually stole a whole bunch of Toei letterhead requests for permits, so places that would have otherwise not let me borrow the location gave me permission to do so. What advice would you offer to Japanese independent filmmakers at the start of their careers? Many young directors nowadays make movies about worlds they know nothing about. For example, a person from a completely normal family would create a film about divorce, even if they have never experienced it. I believe that directors should start with something that's based on their own experience. For example, with George Lucas, he is famous for Star Wars, but he started off with American Graffiti because that was the world he was most familiar with. Because Lucas would race cars, so in American Graffiti, there are scenes like that. And of course, even in Star Wars, there are scenes with lots of speed. Do you have any projects currently lined up for the future? Right now I have three projects in development. One is a true story based on Japanese history. Another is about the Chinese revolution one hundred years ago that was started by Dr. Sun Yat-sen - and interestingly enough, the investor for this project is Japanese. And another movie I have in the works is one about Chinese secret societies - kind of like The Godfather in Asia. I don't work with Japanese producers anymore. These projects have all been taken by producers in other countries. I get offers from producers in other countries who make films like this all the time. If a Japanese producer was able to do something like this, I would work with them, but so far there hasn't been anybody who could do this. I don't think that these films would be possible in Japan. Basically, I don't need a producer. I am the director, but also the producer. I don't want to sound egotistical, but there is nobody in Japan who can do the production work that I can do - including my Hong Kong connections. If there was somebody in Japan who was able to do the work I do, by all means I would love to have them on board because they could save me a lot of time and work. But as it stands, there is nobody in Japan who can do this at the moment.